The Reserve at Lake Keoweeâs unique design is based on the concept of the village being the heart of the community. This home allows you to enjoy that concept to the fullest while offering a sense of privacy and views that rival most waterfront homes. It is an easy stroll to the pool complex, clubhouse, Great LawnÂ¬Â¬ and popular gathering space known as THE MARKET. Your boat slip is as close as it would be on any waterfront lot and is bordered by a path that runs along the lakefront. 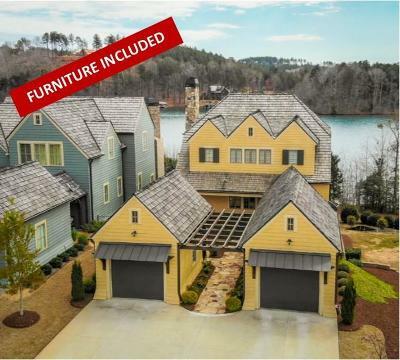 Expansive Lake Keowee views command attention from the moment you enter the home and are enjoyed from most every room on each level. The Great Room extends the length of the home and flows easily to the covered porch beyond. The SC weather affords residents the option of al fresco dining most of the year and with the lake backdrop why resist. Inside the impressive stone fireplace acts as another focal point enjoyed from every angle. The main level open plan is thoughtfully arranged and lends itself to having the Great Room, Dining Room and Kitchen work together to provide comfort and size for just about any gathering. A well thought out butlerâs pantry is perfect for the host to prepare and serve drinks without disrupting conversation. The upper level is dedicated to the owners use with a master retreat where they can relax and recharge indoors or enjoy the sunrise, moonrise or vivid starry nights on the open deck that extends across the entire home. Although designed to accommodate two bedrooms, the current owners opted to utilize the adjoining bedroom as an office. Both rooms boast full baths and French doors to the deck that overlooks panoramic lakes views. Like the main and upper levels, the Terrace level includes outdoor options with its covered patio spanning the length of the home. Step off into the yard and take a short stroll to the docks and dangle your feet in the lake. Guests will enjoy their privacy as the two bedrooms on this level are at opposite ends of the home. One is ensuite but both enjoy full baths. The recreation room in the middle is used as a billiards room. The French doors leading to the patio also draw in the light and the lake views. The exterior of the Village Point homes brings to mind the colorful look of popular seaside resort living. The unique two car garage configuration creates a flagstone courtyard entryway and another venue for enjoying the outdoors. A catwalk was added for convenient direct access to the main level porch from the front of the home. High visibility screens on main level porch do not impede view. They are individual pane and retractable so are easy enough to raise and lower as desired. The best in âVillageâ living. This Village Point home not only has the best view available, it incorporates customized extras taking it well beyond the basic model originally offered to buyers. The owners contemplated full time living that works well for more comfortable short term stays too. Their upgrades concentrated on both design and functionality. Hickory hardwood floors and a tasteful selection of plumbing and lighting fixtures on the design side and enlarged storage areas reflect just a few of the notable improvements. Neighbors will come running should the power go out. With a Kohler back-up house generator, youâll be the most popular neighbors on the point. Clubâs rental leaseback program is available, making this an excellent option as an investment property if desired. PRICE REDUCTION AND FURNITURE IS NOW INCLUDED! Premier membership is available and must be purchased at closing.